If I haven’t mentioned it before, Drs. Foster and Smith rock. They are located in Wisconsin, so Fed Ex Home delivers to my house overnight. They have finally gone to $5.99 shipping (although that might explain why Kiwi’s Nutriberries are $2 more expensive for a 3-pound bucket). They have almost all of the supplies I need for birds. Many treats and toys for Shadow. And now, they have found a glucosamine tablet that Spooky will eat. When his vet said that it couldn’t hurt to put him on the supplement, I was sure that I would be spending the rest of his life looking for something that he would take. I started at Bentley’s Corner Barkery, a boutique pet shop in Arlington Heights. It is a very nice place with a great staff. I consider it out of my price range for day-to-day supplies (although seriously, since all of our dog and cat food is now coming directly from the vet, it probably isn’t much different), but on a such a mission for Picky Spooky, it was worth a try. They had some chewable glucosamine supplements, but they were chewy treats. And Spooky only likes crunchy treats. 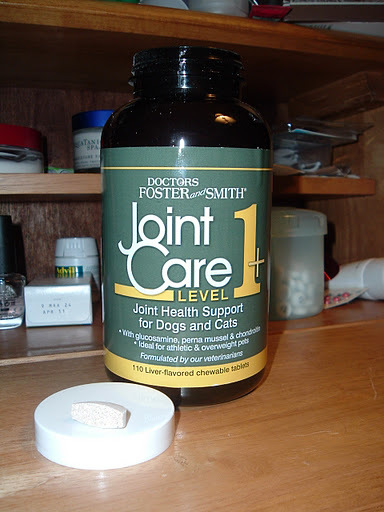 So I went online and ordered the cat version of the supplement that Shadow takes. And…I hesitate to say it, because it has only been a week. But he seems to like it. The first time, I put a half-tablet in front of his paws as he was lying in his bed. He turned up his nose. I put some of his own treats with it and left him alone. When I came back a couple of hours later, the cat and the treats were all gone. I was convinced the dog had come in and eaten them. The second time, he waited for me to leave and when I came back, he had gone back to sleep, but the treats were gone. No way was the dog going to take treats from under the sleeping cat’s nose. He would be dead if he tried. Third time, I didn’t leave the room. It took about 45 minutes, but he ate it when he thought I wasn’t looking. And tonight, he didn’t wait for me to leave. It was the first thing I tried! You cannot possibly understand how happy this makes me. This entry was posted in Great Websites, pets.